First off this post contains spoilers, I will mark when they start, don’t read beyond that point it if you haven’t seen Rogue One yet! I hadn’t been to the cinema since Captain America Civil War last year, there are various reasons, not having the right carer at the right time, anxiety of being closed in, wheelchair issues and the fact that it’s far easier, more comfortable and cheaper to watch things in bed at home. As a Star Wars fan I really wanted to see Rogue One on the big screen like I had for the originals many years ago, and as I’ve also wanted to see something in IMAX since I was a child too I decided that I would pay the extra and give it a try. The local Cineworld has an IMAX screen which made things easier, although it meant using their small lift again, luckily I didn’t bash my feet and damage my ankle this time. The IMAX glasses are slightly different from standard 3D glasses but they fitted over my regular glasses and mask with little problem. The disabled seating was right at the front and a few metres from the screen, as there wasn’t much space in front of me I couldn’t recline my chair very far which meant seeing the whole screen was impossible. Before the film started my anxiety began to rise, being in a cinema with lots of noise means that should something go wrong with my ventilator my carer wouldn’t be able to hear me or the alarms and also wouldn’t be able to see the distress on my face, I find this quite worrying. The film started and the 3D effect was amazing, no blurring that you can see on regular 3D movies sometimes, the colours were clear and not washed out, black was really black but details were still clear, the sound was good although sitting so close to the front limited the surround effects severely. From the start you could tell it was a Star Wars film, it just had that feel, it started with a young girl and her parents, the girl would obviously grow to be the stories hero, they set it up well, the girls mother dies and her father is kidnapped by the Empire, she escapes and is brought up by a rebel mentor, very Star Wars. We then meet a roguish rebel, certainly no Han Solo and honestly I couldn’t connect to him, he rescues the young girl now grown up and takes her to the rebel base, during this you also get to see star destroyers and other familiar faces as the Death Star backstory unfolds. I should mention here that Disney have done an amazing job with CGI and incorporating stuff from the episode IV, most notably Grand Moff Tarkin, it’s like watching Peter Cushing back from the dead, I looked hard for flaws but couldn’t spot anything! After a meeting with the rebels our heroes are sent off to find the Rebel who brought up Jyn and bring him back to the rebel fold, this doesn’t go as planned and we see the Death Star used for the first time. They manage to escape picking up some more misfits to join their crew, this includes a blind man who is obviously force sensitive but not a Jedi. At this point I had to get out of the screen for a ten minute break, my mask straps were digging in and rubbing my head making it very sore, the glasses were also digging in and being so close to the screen was straining my eyes. On returning the crew were being sent to rescue Jyn’s father, things again didn’t go quite as planned, Jyn’s father dies after telling her where to find the Death Star plans and they ended up running back to the rebel base again. At the base Jyn finds herself, becoming a strong leader and inspiring the troops, again very Star Wars, the officials fight amongst themselves though and reject her plan to steal the Death Star plans. All is not lost though, more misfits join her cause and everyone sets off to the Imperial base without the approval of the Rebel Alliance. The team, now named Rogue One, successfully land at the Imperial base and infiltrate it, the Rebels intercept an Imperial message saying the base is under attack and send in their fleet for support. 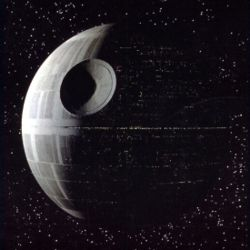 The Death Star plans are located but the base shield needs to be deactivated to transmit the data to the Rebel fleet above, cue an epic space battle with X-Wings, Y-Wings, Tie fighters and star ships. The shield is destroyed and the message transmitted, meanwhile most of Rogue One’s team have been killed fighting. The final scenes tie in beautifully to the beginning of episode IV, Darth Vader arrives with the Death Star, the Rebel Fleet is obliterated, but the Plans are given to Princess Leia for safe keeping, this moment and her saying the one word “Hope” caused a tear to roll down my cheek, I said my final goodbye to Carrie Fisher then with memories of her from the franchise mixed with my very personal memory of her stroking my beard. Rogue One was a great film feeling like an old friend, it sets the scene for episode IV and that’s it’s job, there won’t be a spinoff and there was nothing really unexpected, but this doesn’t really detract from it, we already knew this story in general terms and we’ve already seen the sequels, episodes IV, V and VI, It’s now part of Star Wars and gives us something that feels like part of, and an extension of the original films. This entry was posted in Geeky and tagged accessibility, Carrie Fisher, Rogue One, spoilers, Star Wars. Bookmark the permalink.